"And a prophet of the Lord have they slain; yea, a chosen man of God, who told them of their wickedness and abominations, and prophesied of many things which are to come, yea, even the coming of Christ." 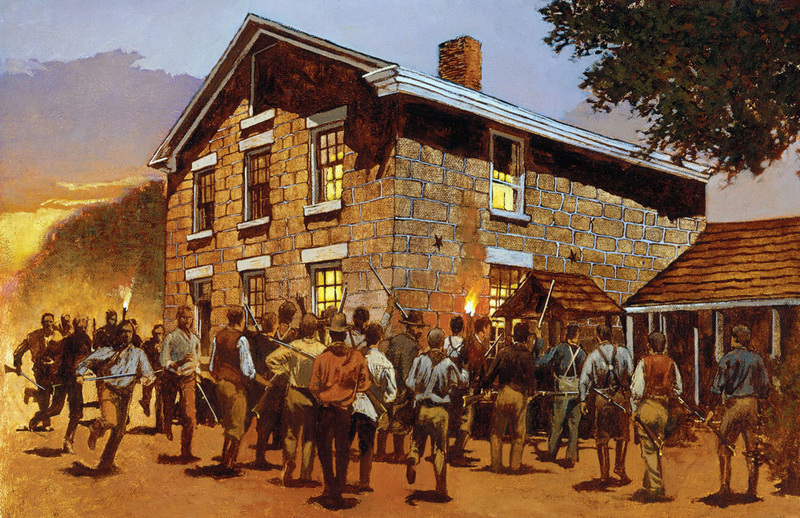 Willard Richard's first hand account of the assault at Carthage Jail, and the martyrdom of Joseph Smith and Hyrum. Possibly the following events occupied near three minutes, but I think only about two, and have penned them for the gratification of many friends. A shower of musket balls were thrown up the stairway against the door of the prison in the second story, followed by many rapid footsteps. While Generals Joseph and Hyrum Smith, Mr. Taylor, and myself, who were in the front chamber, closed the door of our room against the entry at the head of the stairs, and placed ourselves against it, there being no lock on the door, and no catch that was usable. The door is a common panel, and as soon as we heard the feet at the stairs head, a ball was sent through the door, which passed between us, and showed that our enemies were desperadoes, and we must change our position. 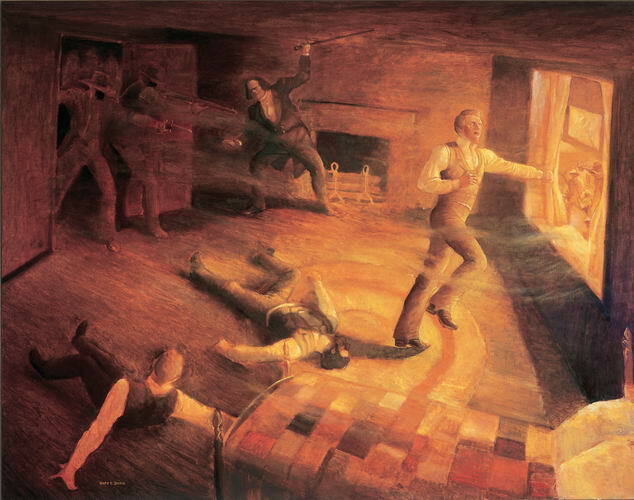 General Joseph Smith, Mr. Taylor and myself sprang back to the front part of the room, and General Hyrum Smith retreated two-thirds across the chamber directly in front of and facing the door. A ball was sent through the door which hit Hyrum on the side of his nose, when he fell backwards, extended at length, without moving his feet. From the holes in his vest (the day was warm, and no one had his coat on but myself), pantaloons, drawers, and shirt, it appears evident that a ball must have been thrown from without, through the window, which entered his back on the right side, and passing through, lodged against his watch, which was in his right vest pocket, completely pulverizing the crystal and face, tearing off the hands and mashing the whole body of the watch. At the same instant the ball from the door entered his nose. As he struck the floor he exclaimed emphatically, "I am a dead man." Joseph looked towards him and responded, "Oh, dear brother Hyrum!" and opening the door two or three inches with his left hand, discharged one barrel of a six shooter (pistol) at random in the entry, from whence a ball grazed Hyrum's breast, and entering his throat passed into his head, while other muskets were aimed at him and some balls hit him. Joseph continued snapping his revolver round the casing of the door into the space as before, three barrels of which missed fire. while Mr. Taylor with a walking stick stood by his side and knocked down the bayonets and muskets which were constantly discharging through the doorway. while I stood by him, ready to lend any assistance, with another stick, but could not come within striking distance without going directly before the muzzle of the guns. Mr. Taylor rushed into the window, which is some fifteen or twenty feet from the ground. When his body was nearly on a balance, a ball from the door within entered his leg, and a ball from without struck his watch, a patent lever, in his vest pocket near the left breast, and smashed it into "pie," leaving the hands standing at 5 o'clock, 16 minutes, and 26 seconds, the force of which ball threw him back on the floor, and he rolled under the bed which stood by his side, where he lay motionless, the mob from the door continuing to fire upon him, cutting away a piece of flesh from his left hip as large as a man's hand, and were hindered only by my knocking down their muzzles with a stick; while they continued to reach their guns into the room, probably left handed, and aimed their discharge so far round as almost to reach us in the corner of the room to where we retreated and dodged, and then I recommenced the attack with my stick. Joseph attempted, as the last resort, to leap the same window from whence Mr. Taylor fell, when two balls pierced him from the door, and one entered his right breast from without, and he fell outward, exclaiming,--Oh Lord, my God!" As his feet went out of the window my head went in, the balls whistling all around. He fell on his left side a dead man. At this instant the cry was raised. "He's leaped the window! " and the mob on the stairs and in the entry ran out. I withdrew from the window, thinking it of no use to leap out on a hundred bayonets, then around General Joseph Smith's body. Not satisfied with this I again reached my head out of the window, and watched some seconds to see if there were any signs of life, regardless of my own, determined to see the end of him I loved. Being fully satisfied that he was dead, with a hundred men near the body and more coming round the corner of the jail, and expecting a return to our room, I rushed towards the prison door, at the head of the stairs, and through the entry from whence the firing had proceeded, to learn if the doors into the prison were open. When near the entry, Mr. Taylor called out, "Take me." I pressed my way until I found all doors unbarred, returning instantly, caught Mr. Taylor under my arm and rushed by the stairs into the dungeon, or inner prison, stretched him on the floor and covered him with a bed in such a manner as not likely to be perceived, expecting an immediate return of the mob. I said to Mr. Taylor, "This is a hard case to lay you on the floor, but if your wounds are not fatal, I want you to live to tell the story." I expected to be shot the next moment, and stood before the door awaiting the onset.